Cosmetic surgery and plastic surgery are two separate medical specialties, with different training requirements. 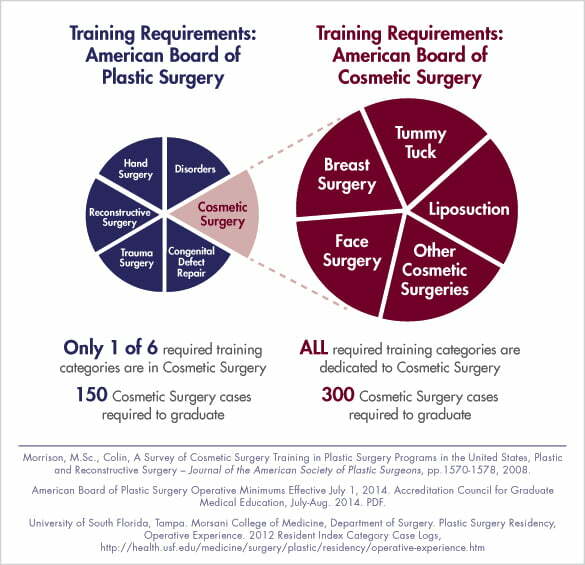 For instance, did you know that the American Board of Cosmetic Surgery requires a surgeon to complete 150 more cosmetic surgery cases than the American Board of Plastic Surgery does to achieve board certification? Know the facts before you choose a surgeon for your cosmetic surgery procedure. The Q&A below will help. Q: What is cosmetic surgery? A: Cosmetic surgery is a unique discipline of medicine focused on appearance enhancement through medical and surgical techniques. Its goal is achieving, maintaining, and enhancing normal appearance. Cosmetic Surgery is a subspecialty that has arisen from multiple fields such as ophthalmology, dermatology, and head and neck surgery (ENT) disciplines. Each specialty has had a major contribution such as eyelid surgery, skin resurfacing, and rhinoplasty. As no one single specialty can claim to “know it all,” the specialty of cosmetic surgery was formed to share and promote the most current thoughts and techniques of the many contributing fields of medicine. As procedures such as liposuction and Las Vegas breast augmentation correction continue to evolve, surgeons throughout the world present these enhancements to cosmetic surgeons to be evaluated, perfected, and placed into practice. A: According to the American Society of Plastic Surgeons, plastic surgery deals with the repair, reconstruction, or replacement of physical defects of form or function involving the skin, musculoskeletal system, craniomaxillofacial structures, hand, extremities, breast and trunk, or external genitalia. It is intended to correct dysfunctional areas of the body and is reconstructive in nature. Recently plastic and reconstructive surgery has placed an emphasis towards cosmetic surgery. The most important thing to remember is that the terms ‘plastic surgery’ and ‘cosmetic surgery’ are not interchangeable. Confusion about the terms has led to public misconceptions about the two specialties. Cosmetic surgery is the “surgery of appearance.” It is elective and focuses on the aesthetics of beauty. Q: How does cosmetic surgery training differ from plastic surgery training? 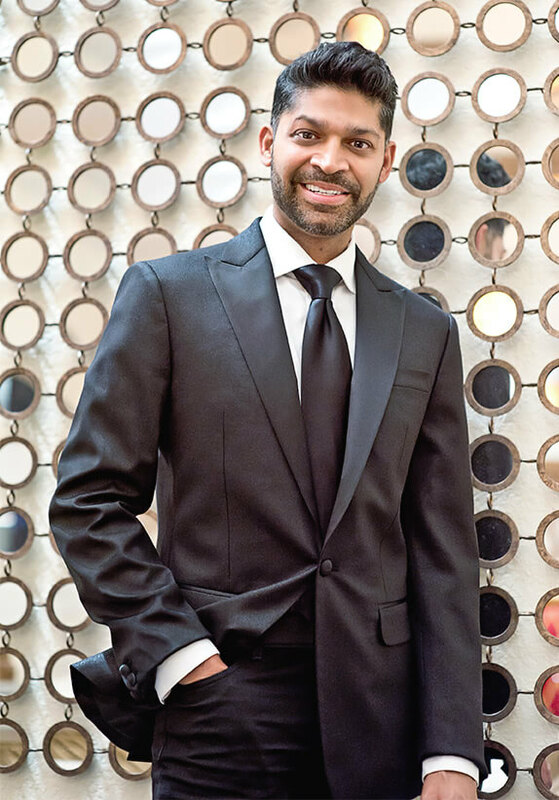 To become a diplomate of the American Board of Cosmetic Surgery, a cosmetic surgeon first completes a surgical residency in a related specialty such as general surgery, oral and maxillofacial surgery, or plastic surgery. After residency, the surgeon receives further training called a “fellowship.” This fellowship is dedicated to cosmetic surgery. The mindset throughout is focused on principles and techniques to surgically enhance appearance. Concepts of beauty and their creation are presented from varied perspectives, refined, and then taught to the cosmetic surgeon to bring the best any specialty has to offer. Q: What does it mean to be a diplomate of the American Board of Cosmetic Surgery? A: The American Board of Cosmetic Surgery is devoted to examining a surgeon’s knowledge and competency in Cosmetic Surgery. It is an independent subspecialty board that examines and verifies the expertise of physicians in general, facial and dermatological cosmetic surgery. To become a diplomate, a cosmetic surgeon must successfully complete an approved, accredited training program and a rigorous evaluation process designed to assess the knowledge necessary to provide safe and quality patient care in that specialty. Prior to taking the examination, the surgeon must first be board certified by an American Board of Medical Specialties (ABMS) or equivalent surgical board, have achieved the status and qualifications needed to challenge the American Board of Cosmetic Surgery examination, which include performing a minimum of 300 cosmetic surgeries, and then successfully pass this two day examination. Q: What are the benefits of having an American Board of Cosmetic Surgery diplomate perform cosmetic procedures? A: We encourage patients to seek medical professionals that specialize in a specific field. The American Medical Association (AMA) recommends that patients choose a health care provider based on his training, education, experience, and demonstrated practice history. American Board of Cosmetic Surgery diplomates are surgeons dedicated to the art of cosmetic surgery. Their approach and mindset, along with a strong knowledge base, high level of training, and practical experience, place them amongst the most qualified surgeons to perform safe and proper cosmetic procedures. Cosmetic surgeons also offer a unique, multi-disciplinary approach to patient care that brings breadth and depth of expertise to the field. Ultimately, you should choose a surgeon based on the procedure you desire. How often does the surgeon perform the procedure and how well is it performed? If it is performed often and well and your interest is peaked, find out if the surgeon is properly trained and licensed. If all checks out schedule a consultation and move forward as you feel appropriate. Overall you will likely find many qualified surgeons. Visit their offices and see if the feel and service is what you expect. We don’t recommend shopping prices but rather shopping results and service as this will likely provide you with the best overall experience. Q: What is the American Academy of Cosmetic Surgery? A: The American Academy of Cosmetic Surgery (AACS) is a professional medical society whose members are dedicated to patient safety and physician education in cosmetic surgery. Founded in 1985, there are over 2500 members of the AACS. As many disciplines of medicine have developed and progressed cosmetic surgery within their field, the AACS is fortunate to have member representation from the leaders of these diverse fields. In this manner, the AACS has remained at the forefront of innovation, technique, and thought. Its diversity is its strength. This strength has allowed the AACS to be the organization representing cosmetic surgeons to the American Medical Association. The Academy, in conjunction with the Cosmetic Surgery Foundation, has educated upon and advanced cosmetic surgery throughout the world through its Annual Scientific Meetings, World Congress, research grants, and innovative surgical demonstrations.